Don’t miss out on this stunning traditional home in a very private setting on a parcel of land that includes 28.67 acres. It has clearings and wooded areas abundant with wildlife and a 2 acre pond stocked with fish. It is perfect for the outdoor enthusiast. The main floor is open and spacious with 10ft ceilings, 2x6 walls, A Geo thermal heat pump and 8ft doors throughout and soaring 22ft ceiling in the huge living room that features a large stone fireplace. Living room opens up to the massive kitchen with tons of cabinet space, granite countertops, with an oversize island and separate bar. Plenty of space for entertaining or large family gatherings. Hardwood floors throughout main living areas with ceramic tile in the kitchen and bathrooms. The master bedroom is nice size with his and hers closets and master bath with separate vanities jetted tub and walk in shower. Main level also includes 2 spacious guest bedrooms, laundry, office, and 3 car garage. This custom two story home also features a 1,865 sq.ft. finished basement that makes for a perfect in-law suite. It has a large eat in kitchen, 2 bedrooms, 1.5 bathrooms. It also has a bonus room and additional 2 car and 1 car garages. The 2nd level is unfinished. It does however have some stud walls and plumbing in place. When finished it has the ability to add an additional 3,000 sq ft of living space. 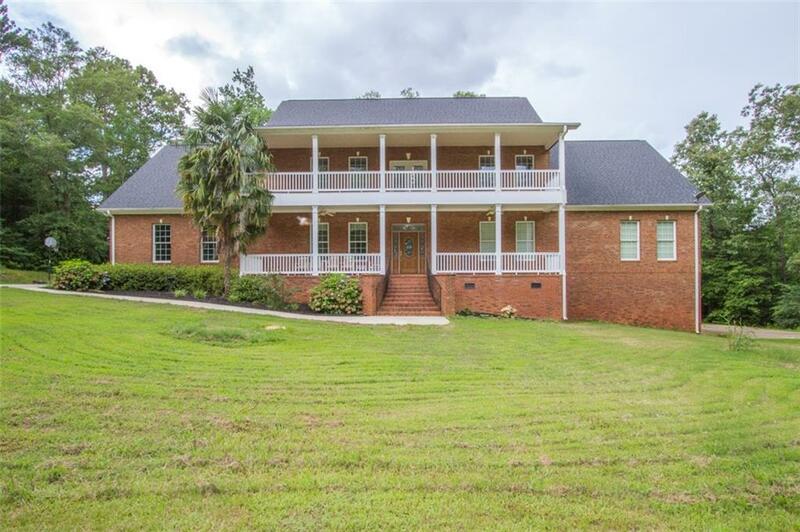 This wonderful home has huge upper and lower front porches and a large rear deck. Property also includes a 1800 sq.ft. workshop. This is truly an amazing home that you must see to appreciate. Basement walls have 10" poured concrete and are 2x4 framed and insulated. This is truly a remarkable home. Please schedule your private showing today!!. This home has a total of 5 bedrooms and 4.5 baths, 2 large kitchens and 5+ car garages. 2 families can comfortably live here!